Ø§Ù„Ø±Ø¦ÙŠØ³ÙŠØ© / software / Sales of Windows 8 would be "disappointing"
Sales of Windows 8 would be "disappointing"
Windows 8 was launched on 26 October and was quickly passed several million copies. However, several sources now speak of disappointing sales. According to an article by Paul Thurrott usually very knowledgeable, sales of Windows 8 would be so disappointing. The author states that he had his information from an anonymous source within Microsoft. The firm obviously very expectation of success on a new operating system, its walls have indicated that the figures did not meet expectations during its launch period, in spite of the four million sold updates on the first three days. Neowin, which echoed the information that Microsoft has reacted in the usual way: the publisher does not want simply not comment on rumors. If one assumes that the information is accurate Paul Thurrott, the interesting point is not really the number itself, but the reasons that could contribute to this state of affairs. Thurrott suggests itself several tracks. There is first of all the reason mentioned at Microsoft itself, namely the lack of attractiveness of the machines sold by OEM. Thurott returns also an idea that is not new but is growing: a significant change and growing relationship with hardware partners. During the conference BUILD, "conversations" so far evoked the idea that Windows PCs could one day be sold exclusively in boutiques Microsoft. Several other avenues are being explored, most explored in our own columns. Crisis, for example, need to play its role, public budgets are equally exposed to risk than firms. Even if the upgrade to Windows 8 Pro is sold only 30 euros (31 January 2013), the majority of users hardly the idea that this kind of operation is possible. Much of license sales is on new machines, and many may prefer to wait. But among the other reasons discussed, we find especially confusing. Confusion we talked several times and takes many forms. This interface could leave some skeptical. One of a range of machines which includes tablet very different in material and equipped with Intel as well, so x86 than ARM chips. Straight to the shelves and the presence of Windows 8 and Windows RT within the same range, while both systems have crucial differences. Also the space available on the shelves, including the area and has already generated a complaint in the United States. Certain disclosures appear likely in the future, because these revelations sales closely follow the mysterious departure of Steven Sinofsky, former director of the Windows division. 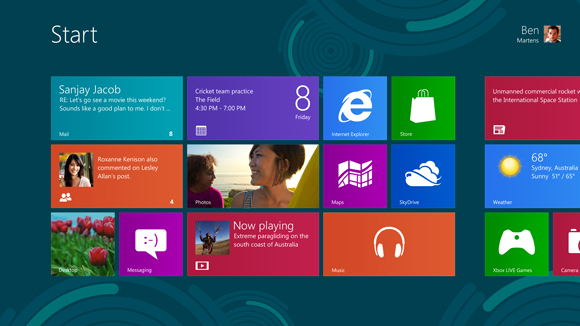 One thing seems certain: Windows 8 will eventually invade all households, even that the game tying. In addition, the system has special qualities, including the touch that will evolve slowly machines sold. Microsoft of course will sooner or later formally communicate the number of licenses sold.